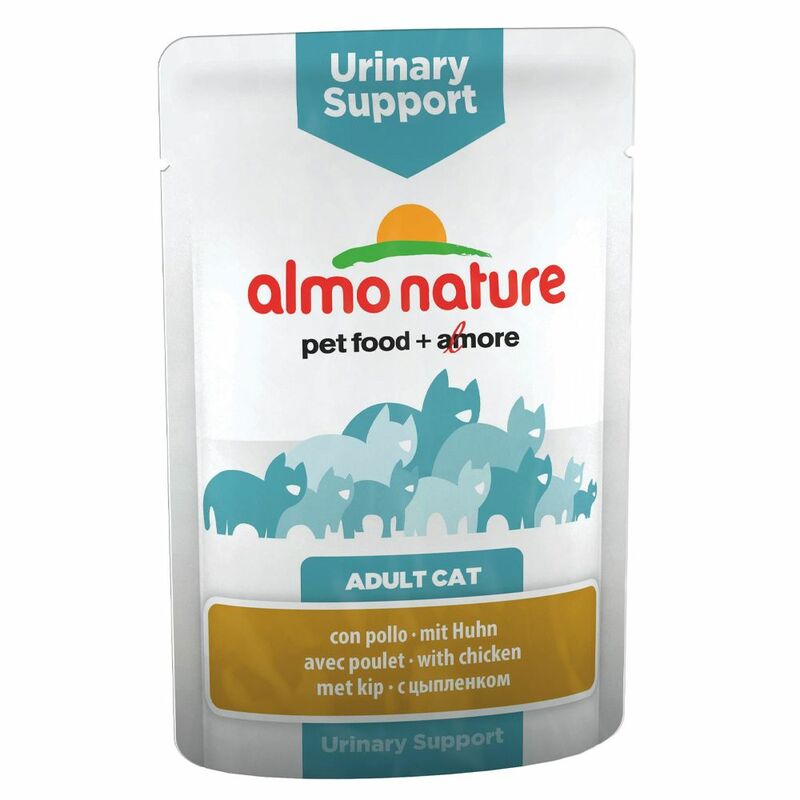 Almo Nature Urinary Support Wet Cat Food Pouches are specially developed to support the functioning of your cat's sensitive urinary system, helping to prevent urinary tract infections. This functional wet cat food contains cranberries to help reduce unwanted bacteria, while the added DL-methionine can have an acidifying effect on your cat's urine. This complete wet cat food features a high liquid content to support natural hydration and a healthy fluid intake, which is important for helping to prevent urinary infections. It also boasts a balanced nutrient profile thanks to the addition of various vital vitamins and minerals, which can help to strengthen your cat's immune system. Taurine, for example, is eΒential for your cat's general wellbeing, supporting their cardiac health and eyesight. Almo Nature Urinary Support Pouches are completely free from chemical additives, colourings and preservatives. The handy pouches also guarantee a fresh taste and make the food easy to serve at mealtimes. Almo Nature Urinary Support Pouches at a glance: Complete wet food for adult cats with a tendency to suffer from urinary tract infections With cranberries: to support the health of your cat's bladder and urinary tract With DL-methionine: has an acidifying effect on your cat's urine Natural hydration: high liquid content to support a healthy fluid intake With taurine: can strengthen your cat's heart and eyesight Vitamin and mineral complex: supports your cat's immune system 100% natural: free from chemical additives, preservatives and colourings In handy pouches: easy to serve and keeps the food fresh.